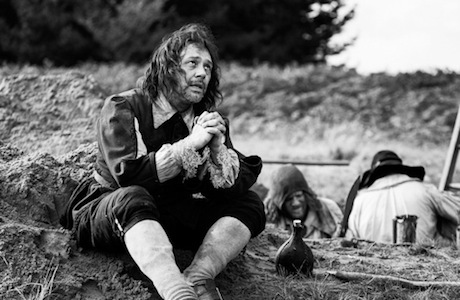 For his latest film, gutsy British director Ben Wheatley has made a gritty, grimy, experimental period piece that feels like hyper-surreal battleground folklore given immersive sensory life. Working from a script by creative partner Amy Jump, the man responsible for Sightseers and Kill List has a distinctly otherworldly vision for the telling of this deliberately circuitous story. A devout coward is rescued in the heat of battle and forced to engage in black magic to help a man who may be the incarnation of pure evil find a buried treasure. Emphasising the primal earthiness of these scattered soldiers and the history-steeped, pagan mysticism of the British countryside, A Field in England wears its sepia-filtered colour palette like a puissant shroud of dirt. The film is stacked with layers of metaphor punctuated by incisively edited symbolic scene stingers. Inscrutable tableaux work hand in hand with slow motion shots that accent, by turns, the grotesque beauty and mirthful horror of any given situation to convey a sense that something is being staged out-of-phase with reality. This is before our group of army deserters begin shovelling down mouthfuls of psychedelic mushrooms they find growing in a field like a bulging vein in the earth. Prior to, and between, increasingly warped trips, including an inventive, geometrically restless stroboscopic centrepiece of madness, Wheatley metes out snippets of plot via conversations that also reveal the colourful personalities that form the ragtag group on the hunt for an occult object. There's plenty of cheeky British wit and gruff base humour to offset the chaos, insanity and violence saturating every frame of this picture. Especially with some of the extreme choices in sound design — we're talking Eraserhead levels of unnerving sonic assault — A Field In England can be difficult to take, at times, and for some viewers it'll be completely impenetrable and alienating. However, that's also what makes it such a unique film. In time, especially in England (since it's strangely patriotic and culturally insular), this is exactly the type of self-possessed experimentation that'll develop a fervent cult following and innumerable interpretations.